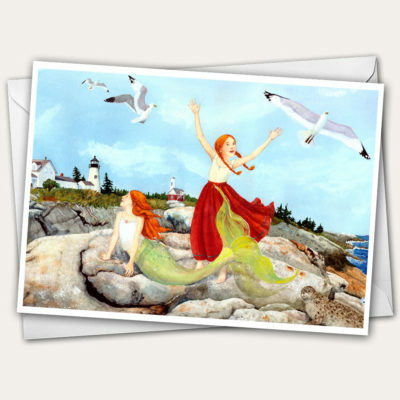 This image is from a story I wrote, called “Singing With Mermaids”, set near Pemaquid Lighthouse on the Maine coast. It’s about a young girl with a beautiful voice, who swims and sings with the mermaids. Notice their friend, a young harbor seal, in the lower right corner. It’s a joyful image and I think it would make a lovely congratulations card or birthday card.